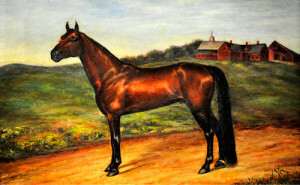 The Scott Leighton Art Gallery highlights the life of a Maine artist whose paintings were significant to highlighting the Standardbred horse in the 19th century. The Gallery also includes the Art of the LIthograph, The Art of the Engraver, and Contemporary Equine Artist. The Leighton Gallery is also dedicated to the memory of Alene Leighton Thompson. It seems most appropriate that Scott Leighton is buried near his home town of Gray, Maine, yet only five miles from the Cumberland Fairgrounds where trotting horses are trained year round. Scott Leighton was born in 1847 in the town of Auburn, Maine, but grew up and attended school in Gray. Thank you to the Old Print Shop for many of the antique prints. Between 29 & 30th Sts.